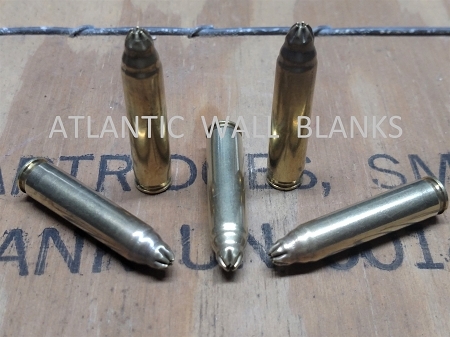 5.56 / .223 blank made just for launching golf balls from AR15 carbines. Depending on the ball used this round will give you roughly 450 yards when fired from a 40-50° angle and 300-350 yards at lower angles of about 30-35°. NOT FOR USE IN THE X PRODUCTS CAN CANNON. We have thoroughly tested for positive function in modern 30 round magazines with anti-tilt followers as well as Surefire 100 round coffin mags. Most 20 round magazines will not feed well with this round though PMag 10 round mags work well for those in States with mag limits. Copyright Atlantic Wall Blanks. All Rights Reserved. eCommerce Software by Lost Tribe Media, Inc..